I hate politics. I hate confrontation. I hate divulging my innermost thoughts because that means I might get hated on. But there are times when I have to take a deep breath and dive into the frey. Because sometimes taking a stand is more important than protecting your own feelings. I have two thoughts on flags right now. As much as I care about other people, these thoughts have to do with me. 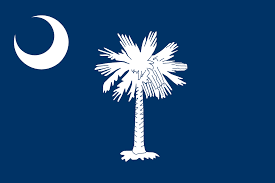 THOUGHT #ONE - South Carolina has one of the most beautiful flags to fly over a state capital. It is a beautiful flag for a beautiful state full of beautiful people. We have our problems, sure. Not everyone or everything is beautiful all the time. But there is no denying that, just as our flag represents, we are hopefully resilient and always looking up. 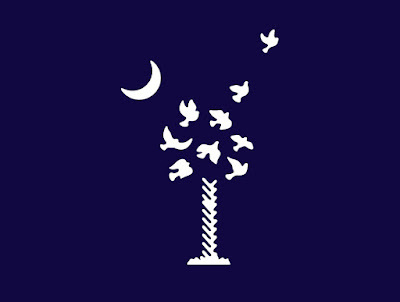 In the aftermath of the horrific shooting at Emmanuel AME Church, Charleston artist and friend Gil Shuler​ did a brilliant job of interpreting our flag in a way that helps us all visualize our feelings. Which is why we need art (and brilliant artists) in our state. Keep it up, dude. Art Credit: Gil Shuler Graphic Design Inc. 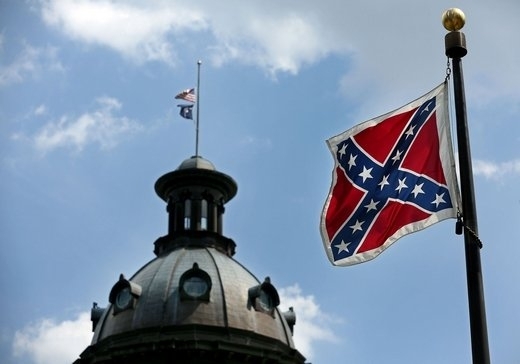 THOUGHT #TWO - South Carolina flies another flag on its capital grounds that does not belong. I do not give one freaking fig whether CEOs of companies who come to SC from-off like or dislike it. Companies are not people, regardless of what the tax laws say. I, however, am a tax-paying citizen of this state. I am a Carolina girl born and bred. I am a white woman with a rainbow coalition of friends and family. And I have the blood of CSA soldiers running through my veins. The flag my ancestors fought and fell under is part of my heritage. They did what they thought was right.